Cook Discloses Apple Pay Transactions Showing That Growth Continues, Albeit Somewhat More Slowly Than Before | NFC Times – Near Field Communication and all contactless technology. Apple release global transaction numbers for its NFC digital payments service Tuesday. While growth continues at a healthy pace, increases are slowing somewhat. It was only the second time that Apple has released any specific transaction figures for Apple Pay, following its fiscal third quarter ending last June. 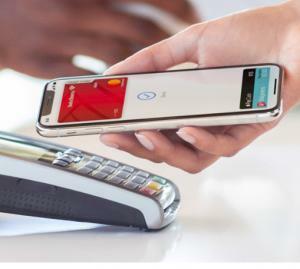 For that quarter, Apple reported that it had hit more than a billion Apple Pay quarterly transactions globally. It means that Apple Pay transactions increased by around 80% in the six months between the third quarter of last fiscal year and the first quarter of this fiscal year. But while the “well over” 100% growth in transactions for the most recent quarter as compared with the same quarter last year represents a healthy growth rate, it shows Apple Pay’s growth is starting to slow as the more than four-year-old NFC payments service matures.